To become the embodiment of jolly old St. Nick, CompAndSave.com, a leading provider of printer supplies, will offer its customers a chance to win 12 different gifts, worth $8,500, with no purchase necessary during a Twelve Days of Christmas Giveaway. Starting Dec. 16th- Dec. 31st, CompAndSave.com will host a 12 Days of Christmas Giveaway in reference to the 12 Days-of-Christmas carol. A winner will be drafted amongst those who enter the giveaway, and that winner will receive an expensive gift from CompAndSave.com. Customers who enter the contest on one of these dates will have a chance to win some of the most popular gift items on the market, which includes a 1/2 CT diamond ring, valued at $1,400, on Dec. 20th, a 16GB iPad Air on Dec.25th, a 50" LG 1080p Plasma TV on Dec. 31st, and much more. In the spirit of giving, CompAndSave.com will use a legion of different channels to broadcast this extravagant giveaway, which includes online channels, such as e-mail, social media, blog posts, YouTube and online magazines, as well as newsletters, T.V. ads, direct mail, and mobile applications meant to remind customers of what prize will be given and on what day. 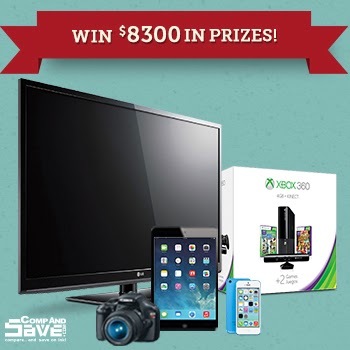 CompAndSave.com will randomly choose a winner from a list of customers who entered to win a gift during that day, whether you make a purchase or not. With the slogan “MY TRUE LOVE SENT TO ME,” CompAndSave.com will underline how much they love their customers, for the entire month of December, and deem itself the corporate equivalent of Kris Kringle, by delivering gifts to customers all over North America. CompAndSave.com sells compatible and re-manufactured ink & toner cartridges costing up to 80% less than the genuine brand. The cost of buying an inexpensive ink or toner cartridge in order to enter your name into the raffle pot is nominal and is nowhere near the value of the gifts. For more information about CompAndSave.com and how to enter the Twelve Days of Christmas Giveaway, visit the website at www.CompAndSave.com/Christmas and subscribe to the mailing list, www.CompAndSave.com/MailingList_subscribe.asp, for a chance to win amazing gifts and receive discount offers.